Happy Friday, y’all! Today I wanted to talk all things summer beauty and share some products with you guys that I’ve truly come to LOVE. I don’t know about you guys, but I’m so particular about the products I use in the summer because you’re battling everything from heat and humidity (can I get an amen from from Texas girls?!) to lots of the in the sun + a major need for SPF. Plus in the summer, I feel like I want a lighter makeup routine that can still last throughout the day without melting off my face or looking cakey. So today I want to share some of my absolutely favorite products – from dry shampoo to blush – that I think every girl needs in the summer months! And, most of these are under $50! Hourglass Bronzer: Truly this is the only bronzer you’ll ever need. This applies so beautifully and has the ideal amount of shimmer. I love that it looks natural and gives you that perfect sun-kissed look without ever looking orange or dirty (y’all know what I mean?). I’ve been using this all summer and I’m obsessed! 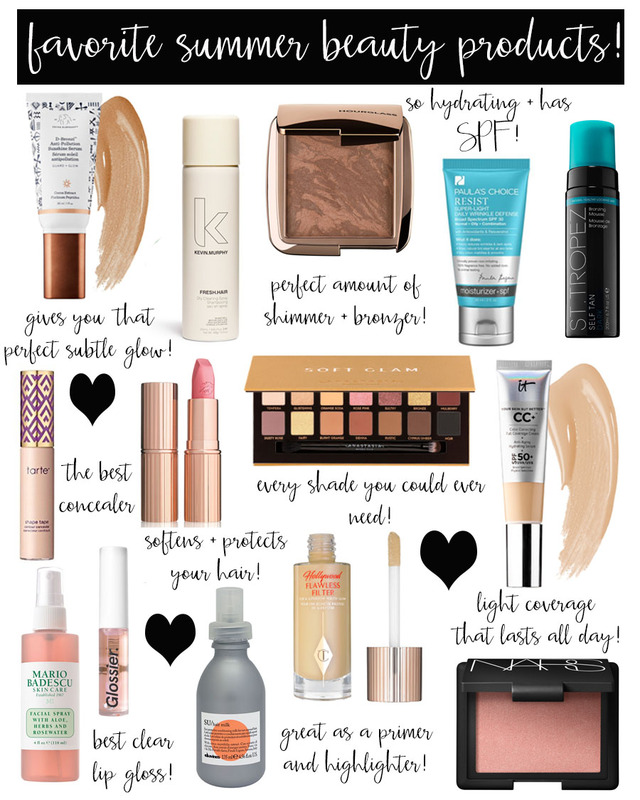 My go-to shade is ‘radiant bronze light’ so if you’re pretty tan like me, then that may be the best shade for you! I apply it with this bronzer brush (a total splurge that I have yet regret – it’s incredible!). Kevin Murphy Dry Shampoo: Okay this stuff is legit. Y’all know I’m a firm believer in not washing my hair everyday, so I need a good dry shampoo to make that possible. This stuff smells good, gives you extra volume, and doesn’t leave your hair a with a white-ish tint like some other dry shampoos do. A little goes a long way, so I think a bottle usually lasts me a few months! Charlotte Tilbury Hollywood Filter: So I know some girls use this to replace their foundation or CC cream, but I honestly love it as a primer or to mix in with my CC cream to give me a slightly dewy finish (without looking oily). If you’re wondering how to get that summer glow with your makeup, this is seriously the best stuff! It isn’t overly shimmery or dewy, so it works well on every skin type. Glossier Lip Gloss: Looking for a clear gloss that doesn’t leave your lips all sticky? This is it. It applies the perfect touch of sheen to your lips and it lasts for hours! I love keeping this in my purse or beach bag for an easy touch up. There’s just something about a clear gloss that makes me feel a little more put together without much effort at all. Layers so well over any lipstick too! Drunk Elephant D-Bronzi – this stuff is AMAZING for those days you don’t want to wear makeup, but still want a bronzed glow. You can mix a little bit in with your moisturizer in the mornings and it looks like you just got back from the beach. It also has antioxidants in it and will do amazing things for your skin! Paula’s Choice Moisturizer – I just now started using this moisturizer during the day and I’m obsessed. It has a slight tint to it and also blurs any imperfections AND has anti-aging benefits. I love that it has SPF in it too. This works great if you want to go makeup-less but you could also use this as a foundation primer. I love it and it’s a great price. St. Tropez Dark Bronzing Mousse – I’ve done a blog post all about my favorite self tanner, so y’all already know I love St. Tropez. This one though is amazing if you want to be REALLY tan. Or, if you’re like me and have naturally pretty tan skin, and regular self tanners don’t do much for you. This one will definitely take your tan to the next level, without looking streaky or orange. It legit looks like you just got back from a beach vacation! Anastasia eyeshadow palette – I am a creature of habit when it comes to eyeshadow. I’ve worn the urban decay naked palette for probably 5 years now, and that’s it haha. But I read great reviews about this one and have been LOVING it! There’s so many different looks you can do with it. You can make it a natural eye look, or go for the intense smokey eye. The colors are rich and a little bit goes a long way. I also love the brush that it comes with! Have you guys tried any of these products? Or do you have any favorites I need to try out this summer? Let me know in the comments below! Have a great weekend! Beautiful finds! I’m in love with all the Charlotte Tilbury products right now. I just got the cream blush that’s part of the filter collection and it’s so pretty! I think I need this Hollywood Filter too! yes that whole collection is beautiful! I literally just bought the shape tape concealer last night and used it for the first time this morning and LOVED it! Also wearing the CT lipstick today which is so pretty. I have hourglass highlighter – I need to try this bronzer! yes! aren’t those products amazing? seriously can’t live without them in the summer! LOVE the Paula’s Choice moisturizer! It’s perfect for my oily skin in TX heat. It’s definitely a keeper! agreed! such a great moisturizer! Have you ever tried Beauty Pie products? ?